— THERE IS ALSO DISAGREEMENT on how much to spend on border barriers, and where such structures should go. FOR YOUR RADAR — “Top Pentagon official in Afghanistan amid push for peace,” by AP’s Robert Burns in Kabul: “The Pentagon’s top official made an unannounced visit to Afghanistan on Monday to meet with U.S. commanders and Afghan leaders amid a push for peace with the Taliban. Pat Shanahan, the recently installed acting secretary of defense, said he has no orders to reduce the U.S. troop presence, although officials say that is at the top of the Taliban’s list of demands in exploratory peace negotiations. REMEMBERING WALTER JONES — SARAH FERRIS: “Rep. Walter Jones, a Republican congressman of 24 years who honed a legacy for bucking the GOP on the Iraq war, died Sunday on his 76th birthday. Jones — who faced no challenger last November — had already announced this would be his final term. The 13-term North Carolina Republican had not voted since September, and was too ill to travel to Washington for a swearing-in ceremony last month. TRUMP’S MONDAY — The president will have lunch with VP Mike Pence at 12:30 p.m. He will sign an executive order on “Maintaining American Leadership in Artificial Intelligence” at 3 p.m. in the Oval Office. He will leave the White House at 3:35 p.m. en route to El Paso, Texas, where he will speak at a political rally before returning to the White House. — FOX NEWS HOST LAURA INGRAHAM will interview the president in El Paso after his political rally. The interview will air at 10 p.m.
2020 WATCH … THE BIG PICTURE — NATASHA KORECKI and CHARLIE MAHTESIAN: “‘Breakthrough moment’: Anti-Trump fires forge historic field of 2020 women”: “That ‘highest and hardest glass ceiling’ Hillary Clinton talked about shattering? As of Monday, there were five more big cracks. … The roster of women officeholders vying for the Democratic nomination now numbers five — more than in any presidential primary election in history. — ELENA SCHNEIDER in Minneapolis: “Klobuchar jumps into presidential race”: “Sen. Amy Klobuchar leapt into the 2020 presidential race Sunday, becoming the first Midwestern voice to join the field taking on President Donald Trump. BEZOS BEAT — “Jeff Bezos’s Journey From Private Family Man to Tabloid Sensation,” by WSJ’s Erich Schwartzel, Alexandra Berzon and Laura Stevens: “One Saturday night last September, a crowd of celebrities, Silicon Valley titans and Hollywood executives gathered at television producer Mark Burnett’s Malibu mansion for a birthday party celebrating venture capitalist Vivi Nevo. The richest of them all was Amazon.com Inc. founder Jeff Bezos, whose stake in Amazon is worth about $125 billion. He sat in the middle of the action and appeared to relish the spotlight, said a guest who knows Mr. Bezos. “A flashy party is not the place many would have expected to find the billionaire, who until recently had usually taken pains to depict himself as an ordinary, even shy, family man. … For more than two decades, Mr. Bezos had built a public persona of a low-key billionaire who did the dishes every night, had a happy home life, valued frugality and was a bit of a nerd at work. — “Mistress’ Brother Leaked Bezos’ Racy Texts to Enquirer, Sources Say,” by The Daily Beast’s Lachlan Markay: “The brother of Jeff Bezos’ mistress, Lauren Sanchez, supplied the couple’s racy texts to the National Enquirer, multiple sources inside AMI, the tabloid’s parent company, told The Daily Beast. 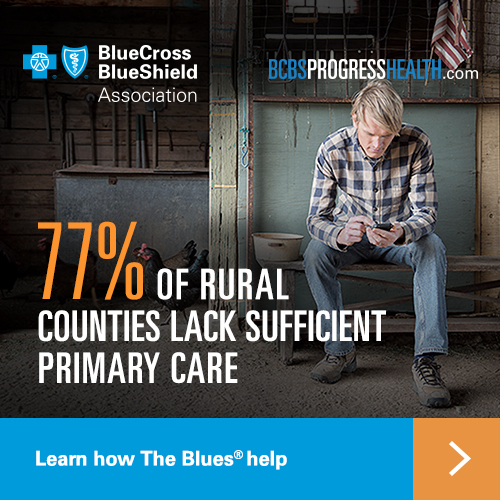 Right now, 77 percent of rural counties lack sufficient primary care. And the shortage is worsening. That’s why Blue Cross and Blue Shield companies are putting America’s former military medics back into action. With scholarships for veterans committed to serving rural areas. Helping them put their real-world experience to work, and filling this critical gap. Broadening access to care, for the Health of America. Learn more here.